‘Thy kingdom come, thy will be done on earth as it is in heaven’. 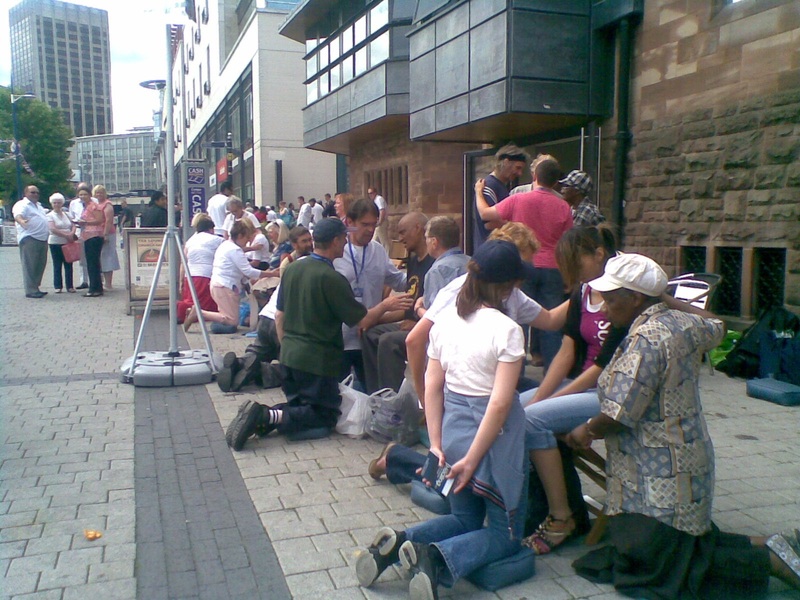 This is what we saw on Oct 5th during Healing on the Streets on Edgbaston St by St Martin in the Bull Ring. This is what happened. I’ll start with this one. A gentleman came sat on the chairs to be prayed for his hernia. He said he had been before. First time he was prayed for his ‘reflux’. He was unable to swallow properly and he was healed. The second time he came he had both knees in pain and MRI scan had shown they were really bad. He was prayed for and the pain went and then the doctors could not understand it as the knees were fine. A lady came back for the second time and said that the first time she came she was healed of a ‘thing in her past’. Now she wanted a prayer for a physical condition. As the team prayed she and the team could see an improvement. A lady asked for prayer for her knees which were in pain. She was due to have an operation. She was in tears when she left not because of pain but because of joy. Let me give you now some more prayers people requested. 4 A lady with a painful family history and low self-esteem. 5 Someone suffering from hypertension and another from bi polar. ‘M’ was asked ‘would you like a prayer today?’ He stopped and did not say anything. He walked towards the chairs and then he said, ‘I am not a believer’, but he sat on the chair. Quickly the team member summoned up another two members and all knelt down by M. He said he and his family need to be safe. His wife is expecting a baby and they also have a two year old girl. They need better accommodation. As we prayed for M the sense of God’s presence increased and that’s when we realised we were visited by a touch from Heaven. We asked for the Holy Spirit to come and bless M and do whatever He wanted to do in M’s heart and life. We waited for a bit and we saw a smile appearing on his face. Yes! We didn’t have to wait any longer. We gave him ‘Why Jesus’ booklet. He stood up with the booklet in his hand and the smile was all over his face by now.